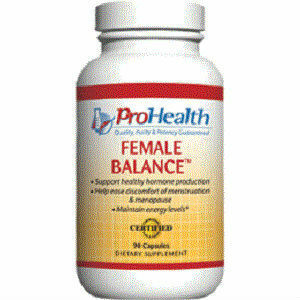 ProHealth Female Balance is a supplement dedicated to support hormonal balance in women. Its main benefits include reducing and relieving the symptoms of menstruation and menopause. Made of herbal extracts, the product is 100% natural, which means that the incidence of side effects is much reduced compared to chemical based counterparts. However, as is the case with all natural supplements, you need to learn more about the ingredients used, to see if the product is, indeed, effective in treating the symptoms you suffer from. What Does ProHealth Female Balance Contain? It is a good thing that this supplement contains vitamin B6 and folic acid, which are both essential for women’s well being and emotional balance. Wild yam and dong quai are two herbal extracts used traditionally for soothing and relieving the symptoms of menopause, so, all in all, this product seems to have what is necessary for reducing the discomfort experienced throughout menopause. The recommended dosage for ProHealth Female Balance is one capsule taken three times daily, with food. The price for a bottle with 90 capsules, or 30 servings, is 23.95USD, which is reasonable for such a product. While the company vouches for the purity and quality of all the ingredients used in their products, no clear money back guarantee is offered black on white. You may need to contact them and ask for additional info if you want to get a refund on your purchase. ProHealth Female Balance is a product indicated for women who want to improve their emotional and hormonal balance. With vitamins and herbal extracts used for the relief of hot flashes, the supplement sounds like a good deal, especially since it is decently priced. Nonetheless, you should shop around a little, as there are other supplements that may be more effective than the one reviewed here. Jackie Horowitz	reviewed ProHealth Female Balance	on May 10th	 and gave it a rating of 2.5.